And finally, we get an extended visit from Irina on Patrones Beach in the Plus sized area! I especially like the detailing on this top. This is the first issue of the Fall/Winter styles so we jolt from beachwear straight into coats! Also, is it just me, or does the cover model look a lot like Billie Piper? Patrones do the best coat patterns, so I’m always excited when I see an issue full of them! This Jocavi trench coat with its asymmetric zipper opening and long cuffs is just so cool! I’m still not totally convinced by the whole cape thing myself, but this Mango one looks very wearable (and reminiscent of the Tessuti New York Cape), and the sheath dress underneath looks like a great basic, too. 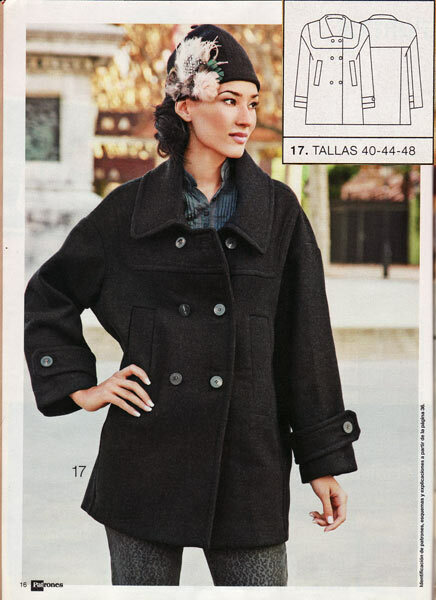 This next coat is just so fantastic, but it has so many details I know would just be wrong for me – like the dolman sleeves and pockets you can’t jam hands into, for starters! But it’s just SO cute on the model, and I must remember to use up some of my leftover feathers on a hat like hers! And this Cos dress is so interesting! It’s like a mock-wrap design, but the two sides meet in the centre and you’ve got all the shaping hidden in those long darts – so cool!! The print for this Desigual dress makes me want to claw my eyes out, but the tech drawing makes it look like a pretty good basic actually. 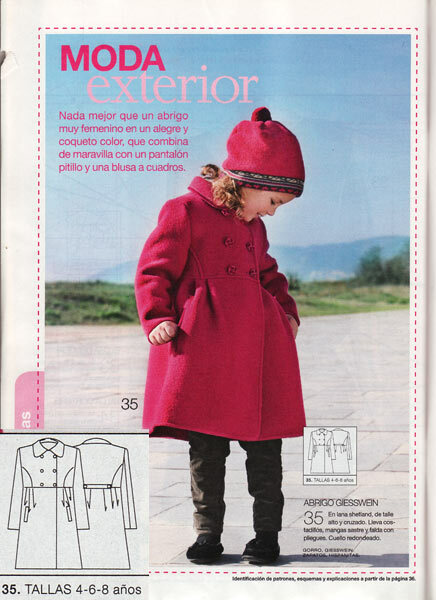 There’s no Plus section in this issue, but there are a few patterns for boys and girls, including this super cute coat for little girls. Can I have one in lady sizes please?? And finally, from the inside back cover of this issue, check out this ad for Spanish romance novels, all focusing on the Scottish highlanders. I find it hilarious that Spanish women are fantasizing about the Scottish men, while we in the UK hold the hot Latin lovers up as some sort of ideal! 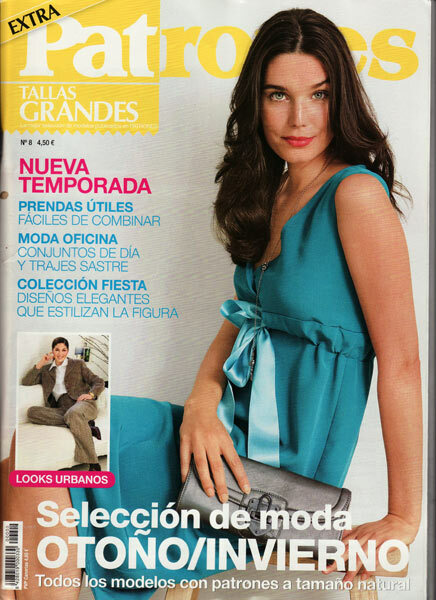 But seriously – why don’t Burda have advertisements in their magazines? It seems to me like this is a fine solution – the revenue they’d bring in should mean they could go back to more patterns sheets are stop having to raise prices every other year, right? As a reader, I kinda expect to see ads in magazines, so adding a few really wouldn’t bother me. After all, all my other pattern magazines have them, and they could even share the English-speaking version across American, English, and Antipodean ads for all I care! A year or two ago, Patrones started reprinting patterns from earlier issues into new, “best of” magazines. These are printed alongside the new stuff, but with a restarted numbering system. The reprints are always low numbers (like 8) and the new editions are always high numbers (like 307). This reprint edition just happened to be all Plus sized patterns, but they aren’t always. So if you’re a massive Patrones fan, you may have seen some of these patterns before, otherwise they’ll likely be all new to you anyway! Just a quick word on Patrones in general – you’ll need to go up a size or two from your Burda size (so this issue would be appropriate for Burda sizes 46-56 or so), and the patterns sheets are WAY easier to trace than even the old-style Burda sheets. But the instructions are only in Spanish, but intermediate sewers should probably be okay with constructing these anyway. Here’s just a few of my picks. Don’t let the Liv Tyler-a-like on the cover fool you – these patterns range in size from 48-58! Luscious coats! Like the amazing seaming and details on this one! So to be in the chance to win this copy of the Plus magazine (I’m keeping 306 and 307 for myself, sorry! ), just leave a comment below including “I’m Plus and Proud!” to be in the draw. If you don’t say that, I’ll assume you’re just commenting on another aspect of this post and leave you out. I’ll pick a winner by random draw next Monday, and I’ll ship anywhere in the world. Good luck! The giveaway is now closed. Congratulations, Sherril! !